The quaternion representation is generally prefered to the Euler angle representation because of its analytical characteristics. The dynamic and kinematic equations of motion are taken as a set of coupled differential equations and integrated using one of the methods described in Section 17.1.2. The integration state vector consists of the three angular velocity body rates or angular momentum components, the attitude quaternion, and any additional degrees of freedom due to nonrigidity (wheels, movable and flexible appendages, rastering instruments, etc.) Alternatively, for spacecraft which have a set of gyros as part of their attitude determination hardware (Section 6.5), the gyro assembly performs a mechanical integration of Euler's equations (irrespective of whether the spacecraft is rigid or flexible), and consequently only the kinematic equations require numerical integration. The gyro package flown aboard a spacecraft usually consists of three or more gyros which are capable of measuring the spacecraft's angular rates. 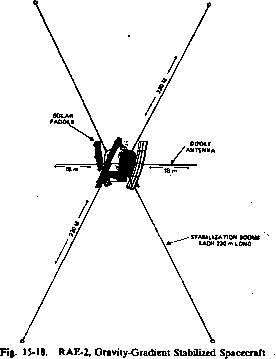 The discussion of the gyro model used to compute the spacecraft's angular velocity from the gyro measurements is described in Section 7.8.2. The attitude propagation problem is diminished for spacecraft which fly a gyro package; in many cases, however, the calibration of the gyro model (see Section 6.5) can be a significant part of the attitude determination problem. Once the appropriate differential equations for attitude propagation have been established, it is necessary to choose a method for solving them. Because exact closed-form solutions of the complete equations to be integrated are almost never available, an approximation method is needed. Two methods are discussed in this section: direct integration using standard methods of numerical analysis, and a method for the kinematic equations using a closed-form solution of the equations with constant body rates. The extension to coupled equations is straightforward, with a few exceptions that will be pointed out. where the number of steps, n, is increased during the limiting procedure in such a way that nh = tn —10 remains constant. Three important considerations in choosing an integration method are truncation error, roundoff error, and stability. Truncation error, or discretization error, is the difference between the approximate and exact solutions y„—y(t„), assuming that the calculations in the algorithm are performed exactly. If the truncation error introduced in any step is of order hp+l, the integration method is said to be of order p. Roundoff error is the additional error resulting from the finite accuracy of computer calculations due to fixed word length. An algorithm is unstable if errors introduced at some stage in the calculation (from truncation, roundoff, or inexact initial conditions) propagate without bound as the integration proceeds. Truncation error is generally the limiting factor on the accuracy of numerical integration; it can be decreased by increasing the order of the method or by decreasing the step size. It is often useful to vary the step size during the integration, particularly, if the characteristic frequencies of the problem change significantly; the ease with which this can be done depends on the integration method used. The computation time required is usually proportional to the number of Junction evaluations, i.e., evaluations of J„=J(tH,y„) that are required. It is clear that decreasing the step size increases the number of function evaluations for any fixed integration algorithm.